Short Leg, Classic Dexter, Dwarf, Achondroplastic or Chondrodysplastic Dwarf, Beef Type, Heterozygote, Carrier, Affected. Long Leg, Normal, Kerry Type, Dairy Type, Proportionate, Homozygous Normal. The problem is that most of the names are either inaccurate or offending. For instance, the Dexter breed as a whole is rather short legged, and even animals dubbed Long-legged are often short legged when compared to members of other breeds. Another problem is that there are a lot of rather large Dwarfs, and a lot of rather small Normals. The difference is mostly in the length of the cannon bone, and a shortened cannon bone produces the classic choppy gait of the Affected/Short leg. Why all these terms? Because of Bulldog calves. The term Bulldog describes a severely deformed calf that is usually spontaneously aborted (miscarried) in the third trimester. To make things as straight forward as possible: What causes the Affected/Short-legged Dexter is a milder form of the Bulldog deformity. The Bulldog trait is known as chondrodysplasia, and it is co-dominant in inheritance. This means that an animal that has one Bulldog allele will be Affected with chondrodysplasia and have a slightly disproportionate build and a choppy gait. 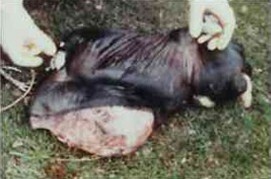 An animal with two chondrodysplasia alleles is Severely Affected and will be aborted as a very deformed Bulldog calf. 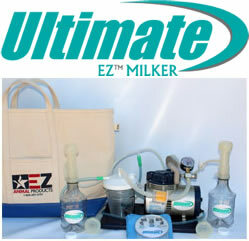 Furthermore, Affected Dexters will never breed true; breeding Affected to Affected will produce a mix of Affected, Normal, and Severely Affected calves. Some basic guidelines for terminology on co-dominant traits, and chondrodysplasia specifically. Normal Homozygous Normal Long Leg, etc. Affected Heterozygous for Chondrodysplasia Short Leg, etc. There are several theories for how chondrodysplasia entered the breed. Basically, it was either a fresh mutation within the breed, or was introduced from another breed. 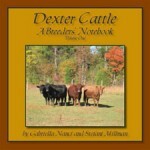 (See History of Dexter Cattle.) Keep in mind, “Dexter” meant “small” to the Irish, and it is likely at some point anything small could have passed for “Dexter.” What is certain is the show ring has promoted the Shortleg, in the same way it promoted “Compact” Herefords and Angus in the 1950′s and 1960′s. These short legged, compact beef cattle were highly favored by cattle judges, but were expressing of a form of dwarfism. 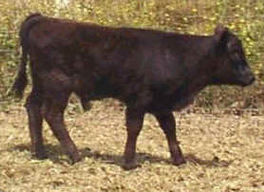 When two Compact Herefords or Angus were bred together, they would produce 25% severely dwarfed calves, sometimes called “snorters,” that were usually euthanized. Dr. Berg makes an interesting point about the “witch hunt.” We are at a point in our breed where technology is available to make educated decisions about how to handle the Short leg Dexters. There is now a genetic test available for breeders who are unable to tell what type they have, for animals that are borderline in type, or for people who just want to make sure. However, we do not need a witch hunt. If an animal is deemed to be chondrodysplasia free by a genetic test, it can not carry the Bulldog trait and cannot pass it on to it’s offspring. An animal that is from two chondrodysplasia-free parents cannot not carry the mutation. Period. You do not have to throw out five generations. Today our knowledge of genetics takes us beyond that. We have a relatively rare breed and cannot afford to lose all our genetic material over one gene. Will people continue to breed Affected Dexters? The answer is likely yes. Test or no test, the bottom line is that some people are attracted to the choppy gait and compressed shape of the Affected type and will always be devoted to this model. The ethical problem is that many new breeders are not aware of the genotype of these animals and do not know what they are buying. They also are unaware that certain precautions can be taken in order to avoid having Severely Affected/Bulldog calves: The only way you can get a Bulldog calf is by breeding two Affected animals together. 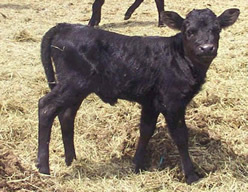 People who want the Affected type can avoid Bulldog calves by always breeding Affected to Normal. As you can see, Affected animals do not “breed true,” since they produce inconsistent results. If the Severely Affected/Bulldog calves were able to grow up and reproduce, they would “breed true” since they do not carry any Normal genes. Also, breeding Affected to Normal gives you the same number of Affected calves as breeding Affected to Affected. And, breeding Affected to Normal eliminates the risk of Severely Affected/Bulldog calves and replaces this loss with Normal calves. Of course, if you only breed Normal to Normal, you don’t have to worry about any of this!